The sign for Northeast Publishing Company is seen in this 2016 file photo. Bangor Publishing Co. announced Sept. 10, 2018, it was shuttering the Presque Isle printing press, citing increased newsprint costs and declining print circulation. 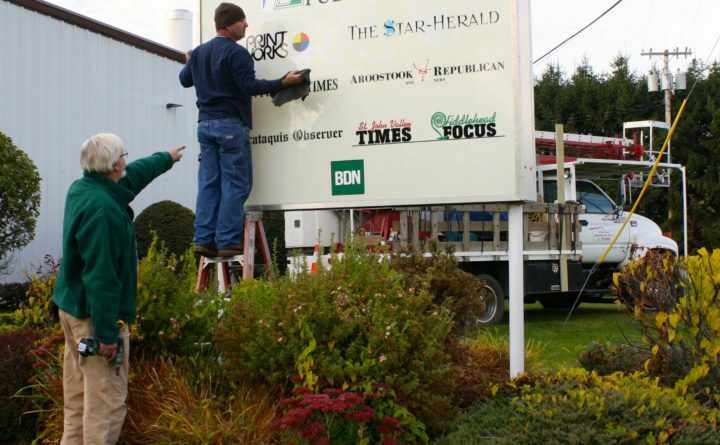 The closure affects the Bangor Daily News and weeklies the Aroostook Republican and News, the Houlton Pioneer Times, the Piscataquis Observer, the Star-Herald and the St. John Valley Times, which will now be printed in Lewiston. Bangor Publishing Co. will soon close its printing press in Presque Isle and consolidate its printing in Lewiston, where it has printed the majority of its papers since 2013, at a facility owned by MaineToday. The closure of the Presque Isle press, operated by Northeast Publishing, will affect the BDN as well as its weekly newspapers, including the Aroostook Republican and News, the Houlton Pioneer Times, the Piscataquis Observer, the Star-Herald and the St. John Valley Times, according to BDN President Todd Benoit. Only the printing service is moving to Lewiston. The offices for the Aroostook Republican, Star Herald and the commercial printing services for Print Works will continue to operate out of the Northeast Publishing facility in Presque Isle. Print Works, a commercial printing company that the BDN operates out of the Northeast Publishing facility, will continue to provide printing services to all of its customers. Seven full-time positions at the Northeast Publishing printing plant will be eliminated when the transfer goes into effect in early October, Benoit said. Rising newsprint prices and readers’ preference to consume news online are the primary reasons for the change, he said. Newspaper circulation at the BDN and its weekly publications has fallen in the past four years, while newsprint cost per ton has risen from $550 in early 2015 to $740 per ton earlier this summer. The current Northeast Publishing press in Presque Isle, a Goss Community model, was installed in 1981. It replaced a Goss Suburban, which had been used since the 1960s. At its peak as a press, in the 1990s and early 2000s, the current press printed 300,000 impressions weekly. By 2018, that weekly number had dropped to 184,000. “Moving our press operations south will help us to continue telling the stories of the communities of Aroostook County,” Northeast Publishing General Manager Andrew Birden said. “It is our calling to record the first draft of the history of the local communities we serve, and this move will allow us to invest in tactics and implement strategies that will sustain our business so we can continue to honor that calling,” he said.